This issue of helden. heroes. héros. extends this scholarly interest to the field of heroised animals, striving to add new perspectives to notions of heroism and the heroic. Animals have long played a crucial role in how we construct our identity as human beings. Over time, our perception of animals and how they relate to us has undergone significant changes. In recent decades, there has been a surge of interest in human–animal relations. The 'animal turn', mainly associated with the 1990s, raised questions of boundaries between men and the rest of the natural world with renewed vigour. 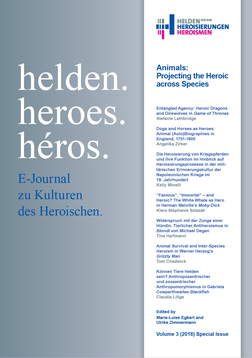 Heroic behaviour has traditionally been conceived of as intrinsically human behaviour but it is a feasible and profitable enterprise to look beyond the limits of species in hero studies.